Hongdae, the pinnacle of youth culture in Seoul, is best known as a hub for fashion, food, music, culture and clubs. 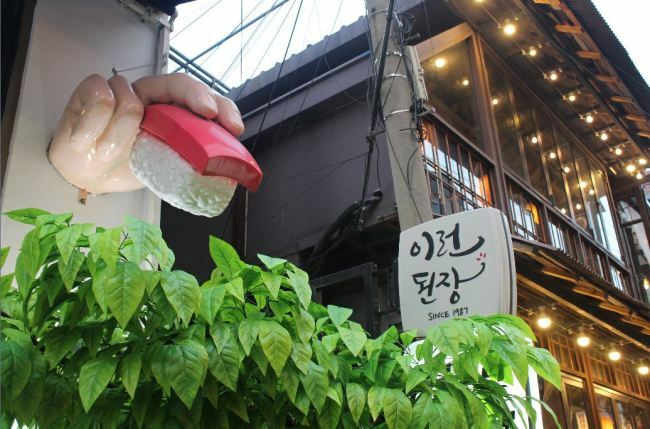 However, some Seoulites are shunning Hongdae for neighborhoods south of the area, such as Mangwon, Sangsu and Hapjeong. “Hongdae is too overcrowded and is becoming too commercial. People want something new and frankly Hongdae is so yesterday,” said Kim Se-Jung, a student at Ewha Womans University. Big companies and retail chains are setting up shop in Hongdae, as tourists continue to flock to the neighborhood in increasing numbers. The area now has stores by New Balance, Kakao Friends, Miniso and Lotte, to name a few. But business has not been great for everybody. 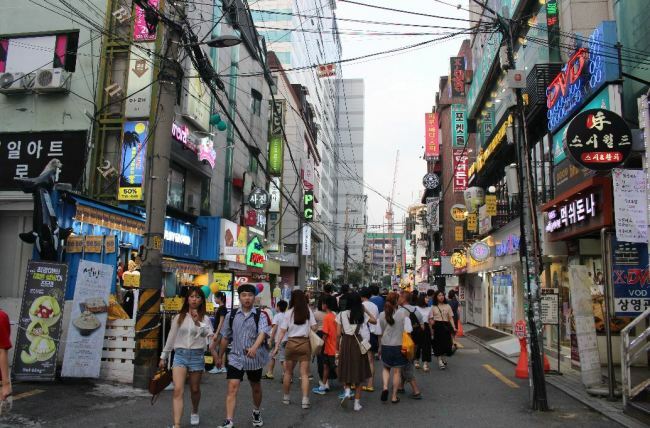 Mapo-gu, where Hongdae is located, had the second-highest business turnover rate in Seoul for 2016, with some 56 percent of businesses failing within the first three years, according to data from Shinhan Card. Statistics for Seoul are equally bleak: 74,080 businesses were shuttered in 2016, which is more than the number of businesses that opened. The high stakes associated with starting a business coupled with the increasing rent prices and operating costs have forced those vying for a space in Hongdae to look for alternatives. Hongdae’s businesses are spilling into Mangwon, Hapjeong and Sangsu, with youths starting to venture to these neighborhoods. Rent prices in Sangsu are lower, but there is less foot traffic, so food prices are sometimes higher than what one would typically find in Hongdae. Yet, those who venture past Hongdae are rewarded with unique finds. Reggae Chicken Sunshine is famous for its fried chicken with spicy curry sauce, and Fell + Cole is known for its adventurous ice cream flavors, such as Makgeolli and Lebanese Rosewater. “The line between Sangsu, Hapjeong and Hongdae is blurry, it’s kind of the same area, but there are more clubs and people over in Hongdae, too much noise, too many tourists. If you’re around 20 or a tourist then Hongdae would be fun, but if you’re not one of those, Sangsu is better.” said a Sangsu resident. Hongdae is home to a diverse range of sounds and music tastes, but what was once a harmonious kaleidoscope of sounds is now bordering on chaotic noise pollution. Hard-hitting hip-hop and rock clash with gentle guitar sounds in the main street. Numerous street performers, who compete for territory, perform within meters of one another -- and it is those with the loudest speakers who grab the attention of the public. A short walk away from Hongik Univ. Station Exit No. 9, one can find Hapjeong, which is becoming a new hot spot for musicians. Hapjeong blends into Hongdae, but at night the sky above it is illuminated with soft fairy lights and lanterns rather than bright neon lights. Cafes are tucked into every nook and cranny, and rooftop bars are plentiful. 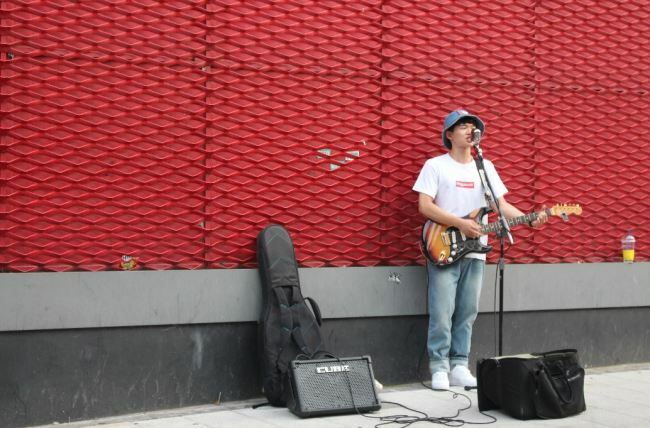 Indie musicians are going for quality over quantity when it comes to their audience, opting to play in small cafe venues rather than having their music drowned out in the main streets of Hongdae. Meanwhile, Mangwon’s main attraction is its traditional market, but trendy cafes and restaurants are starting to pop up in the area. Despite the influx of hip urbanites, Mangwon remains a distinctly working-class area, so there’s an awkward dissonance between the truck workers and young people seeking spots for Instagram-worthy pictures. Zapangi, a cafe that stands out with its bright pink door that looks like a vending machine, always has a long line of people waiting to take a picture in front of its entrance. “I found this place through Instagram and Facebook, a lot of my friends were taking pictures here so I thought I would check it out,” said one woman outside of the cafe. If authenticity and creativity are what people seek, they can find pockets of it in Mangwon. People frequent the cafes here for their aesthetics and experience, which are becoming just as important as the food itself. A quick search of Mangwon on Instagram will bring up hundreds of vibrant, creative photos of food and places. Social media is a tool for exploring hidden gems in the outskirts of Hongdae, and establishments that can create an aesthetic buzz on social media reap the rewards: The more appealing the pictures, the higher the foot traffic. “We stopped hanging out in Hongdae a few years ago, I guess it’s a good place if you want to get drunk cheaply, but for authentic style, Hongdae isn’t really there anymore. Mangwon has become a good spot to chill, and there are so many neighborhoods that have thousands of unique shops and cafes, so why go where everyone else is going?” said a couple in Mangwon.